Don’t Forget to Enjoy These 5 Pre-Wedding Events As We Tell You How! So, it’s official! He asked you to be his forever and you said yes! Woohoo! This is when you put your ‘years of Bollywood-inspired wedding ideas’ to work. Now, don’t tell us you were never inspired by our very own desi Queen ‘Kangana’ when she grooved to the beats of ‘London Thumakda’ or when Raj shook a leg on ‘mehendi laga ke rakhna’ to impress his ladylove Simran or even after watching all the wedding shenanigans in Yeh Jawani Hai Deewani. You’re so focused in the hullabaloo associated with your wedding day that you’ve totally forgotten about the events leading up to the big day! Pre-wedding functions have evolved over the years and how! Any Indian wedding that you attend or witness is just incomplete without the ‘naach-gaana’ and ‘shor-sharaba’ associated with our shaadis. But here’s the good news; you don’t have to do much of the work when it comes to these pre-wedding events. It’s better to leave it to your family and friends to come up with various ideas for the pre wedding functions and trust them completely when it comes to deciding the theme, food, wedding couture and all the other party planning activities. But if you’re still not too sure and want them to know what you expect, then you can very well take a look at the pre-wedding cheat sheet that we’ve made which includes some ideas of how to enjoy the pre-wedding craziness. Now that he’s popped the question and you’ve said yes, you sure want to make the big announcement to your family and close friends and make them a part of your happiness. There are no hard and fast rules as to who hosts the engagement party. Anyone who wants to be a part of your wedding preparations can pitch in and host a magnificent engagement party. The fountain of ‘champagne’: Remember the champagne fountain Ranbir Kapoor breaks in the Badtameez Dil song from Yeh Jawani Hai Deewani? You can have a similar tower of champagne that takes your engagement party to another level. This is a creative way that will not only wow your guests but will also set the mood for the rest of the evening. Everyone enjoys a good love story: Every other person out there is a sucker for romance, so this is the best time to share your beautiful love story with the world. You can create a sweet sign in the form of a signage with a timeline of how the two of you met and your journey together. Get more creative by sharing photos from the beginning of your relationship till the time he proposed. Crafting a video montage of images is bound to make everyone teary-eyed! You’ve got to agree that be it any wedding, if there’s one function we all look forward to, then it’s got to be the sangeet function. The ‘thumkas’ and the ‘latke-jhatkes’ make the whole evening exciting, fun and create some great memories (and crazy pictures too!). If you manage to turn your sangeet function into something wackier, then you and your guests will automatically start to ‘Shake it like Shammi’. Pump up the beats with a crazy Karaoke night: Karaoke is a popular party trend that never seems to get old and makes any party night totally crazy. So, bring out the singer in you and turn your sangeet night into something memorable where you and your close ones can belt out some favourite tunes and rock-n-roll to it. Flash mob is ‘in’: Just imagine taking everyone by surprise through a flash mob. Having a group of synchronised dancers is an interesting way to inspire the environment of reckless fun, thus setting the mood for the entire evening. Choose a theme that reflects your personality: Who said having a theme for your pre-wedding event is clichéd? If you wish to personalise any of your wedding functions, a theme makes everything perfect. If you’re a Bollywood buff, your sangeet function can have a theme based on your favourite song or movie. Dance it out with foot-tapping songs: Ask your wedding choreographer to make you groove to some quirky songs that invite some laughs and loud chuckles. 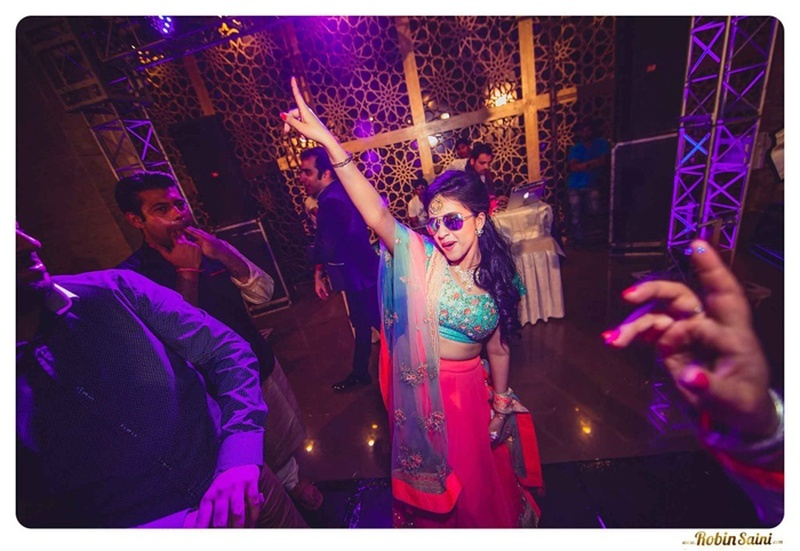 Make the sangeet night a memorable affair by showing everyone present there that you aren’t afraid to get your groove on and tickle some funny bones. If you can’t think of any funny songs to perform to and want some help, then check out these hilarious songs at Seven hilarious songs your wedding dance choreographers must make you dance on and shake that booty! The mehendi function is considered to be one of the most sacred and important pre-wedding events in a bride’s life. The gorgeous bride-to-be adorns her hands and feet with stunning mehendi designs on the ‘mehendi ki raat’. Apart from being a fun pre-wedding function, the mehendi also has a lot of underlying significance attached to it. A lot of brides write their would-be husband’s name in their mehendi and the groom is supposed to find those letters. The belief is that the colour of the mehendi represents the love between the couple and is also considered to be a symbol of fertility.How to make a mehendi function fun, you ask? Here are a few ways to make your mehendi function entertaining. Have a dhol playing competition: Ok, before you ask what, let us tell you that one doesn’t have to be a professional dhol player in order to participate in this competition. This competition can be held for your most boisterous guests and with the help of the musicians and their instruments, you can ask your guests to try and beat each other at playing the dhol. Ring the bottle: This is a fun way of involving your family and friends via this entertaining game. A couple of bottles are placed on the table and each guest is supposed to toss a ring over the bottle. Whoever gets it right gets a cash prize or a gift at the end of the function. Antakshari time: Any pre-wedding function is incomplete without some ‘gaana-bajana’. So, why not organise an Antakshari night? Antakshari has been a part of every celebration and has since then become a trend at every wedding. You can involve guests in this fun activity and pitch them against each other by asking them to hum melodies of popular stars and movies. This way, guests open up and many of them get to showcase their hidden talents. Hand out haath phool and jhoomars to the ladies: These are so ‘in’ right now that incorporating this in your mehendi ceremony would be effective and memorable too! Hand out some beautiful haath phool and jhoomars to all the ladies who attend your mehendi function. These accessories look pretty, elegant and adorable and most ladies would love to adorn them! For other fun ways to make your mehendi function memorable, take a look at Fun ways to kill time while getting your beautiful mehndi design done . A haldi ceremony holds a lot of significance at Indian weddings. It is believed that haldi wards off evil and is auspicious. So, just like any other ceremony, a haldi function too is celebrated with giggles, smiles and a lot of fun surrounding it. Colour coordinated outfits for the bride and her friends: Remember the promise you’ll made? So, why not show your friendship to the world in the form of colour coordinated outfits for both you and your friends? Just imagine the fun you and your gal pals will have when you pose for pictures and are colour- coordinated. Picture perfect, ain’t it? Floral Jewellery: You have to agree that haldi ceremony and floral jewellery is a match made in heaven. Floral maangtikas, floral neckpieces, haath phools, floral earrings and bangles just simply take the ceremony to another level and make every picture adorable. Drinks for the guests: The alcohol can be replaced by the cool, refreshing naariyal paani. You could also serve some soothing coconut water so that your guests feel rejuvenated and enjoy the rest of the ceremony. For inspiration and ideas, visit our inspiration and ideas page. A bachelorette party is one the most awaited pre-wedding events and planning a rocking one requires some ideation. These amazing bridal shower ideas will let your imagination do the talking and allow everyone to have a blast at the same time. Plan an all-girls night out: Girlies, none of the night-outs you’ve had till date will be as memorable as this particular one. So, get set and ready to have the best time of your life. You could deck up the beautiful bride to-be and adorn her with a stunning crown and a ‘bride to-be’ sash; whereas, all the other bridesmaids can use crazy props, which also make a great pre-wedding photography idea. You can even have a makeover session since it’s a girl’s night out! Theme it up: To quirk it up a bit, add an OTT element to your bachelorette by including themes like masquerade, Bollywood red carpet moments or even something as suave as a little black dress theme if you want to add a touch of elegance to your bachelorette. Pump up the adrenaline: You could plan activities like paintball, rock climbing, parasailing, and scuba diving or a simple bon-fire party with your girl gang. The underlying motive of planning a trip or activity is for you to have those few hours with your gal pals before you take the plunge. Indulge yourself: Who doesn’t love to be pampered? A perfect day at the spa is all you and your girl gang needs in order to have fun and paint the town red. This pre-wedding event is important as it marks the end of your singlehood and is a way of spending time with your girlfriends before your big day arrives. For all the dapper to-be grooms out there, don’t feel left out as we have some kickass bachelor party ideas for you too!